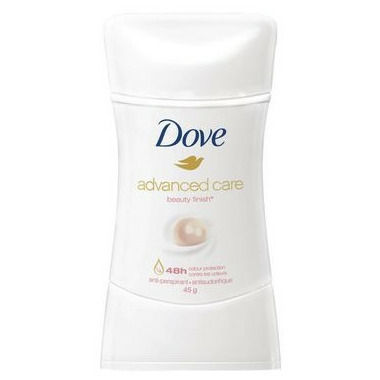 To give your underarm skin a gorgeous glow, try Dove Advanced Care Antiperspirant Deodorant Beauty Finish. It contains Vitamin E and provides great underarm care that is caring to underarm skin. The gentle formula, which contains ¼ moisturizing cream, helps to care for delicate underarm skin while providing 48 hour protection. This antiperspirant deodorant glides on skin easily, giving you a beautiful boost during your morning routine. As with all Dove antiperspirants in the Advanced Care range, the formula is alcohol-free to help care for delicate underarm skin. You can rely on this gentle antiperspirant deodorant for outstanding underarm care and 48 hour protection. This antiperspirant deodorant also helps skin to recover from shaving dryness so that you can enjoy underarms that look and feel softer and smoother.